After the critically acclaimed but dragged out, forced-epic-ness of Django Unchained, I was keen to see where Quentin Tarantino would take his love of the classic Western. 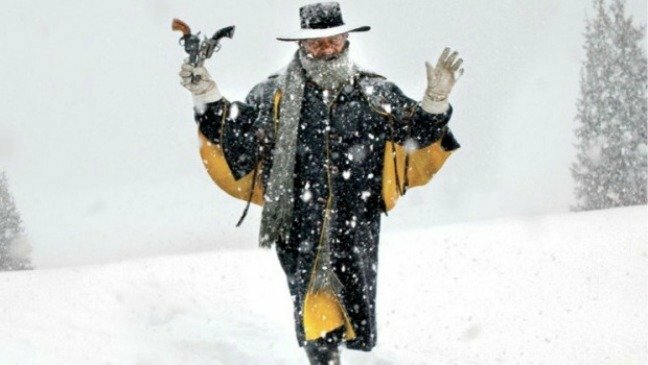 Taking inspiration from 60s/70s serials like Bonanza and The Virginian, Hateful Eight takes all of the’ mysterious stranger comes to town’ episodes and blend them together in a melting pot of snow, lies and violence. Making all eight of the ‘Hatefuls’ a mysterious stranger is a very Tarantino thing to do and with a very strong ensemble cast, the amazing snowy Wyoming plains captured in original ultra-wide 70mm film stock and a new western score from the master Ennio Morricone (despite the Italian stating that he would never work with QT again due to his incoherent placing of music in his films) and you can see why the film has created such a buzz. 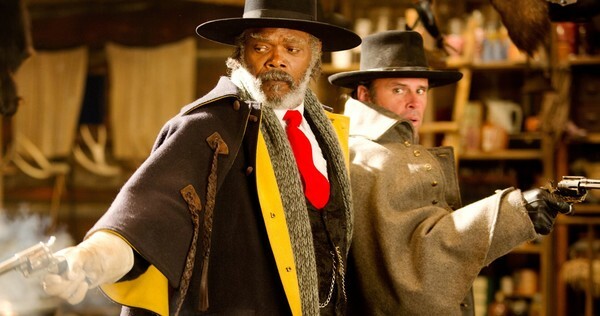 Split into uneven chapters it starts extremely well as a six-horse stagecoach road-trip introduces Kurt Russell, a notorious bounty hunter escorting his latest catch (Jennifer Jason Leigh) to the gallows, to Samuel L. Jackson, a stranded former major in the Republican army. With genuinely funny interplay between the characters and fantastically comic background acting from Leigh, these opening scenes are the perfect introduction. It is therefore a little surprising though that this good start is stilted as a single journey gets cut in half with chapter two almost entirely repeating the opening scene as former Confederate soldier (Walton Goggins) also joins the party, claiming to be the new sheriff of Red Rock. As alliances start to form the stage is set for the chaos later down the line. From chapter three though, the film takes a sharp right. The travellers stop at stagecoach lodge Minnie’s Haberdashery to wait out the blizzard and in a move similar to Tarantino’s Reservoir Dogs we leave the amazing snowy vistas to a theatre style, single set production. On arrival at Minnie’s the travellers find that Lodge owner is missing, apparently visiting her mother in the North, leaving Bob the Mexican (Demian Bichir) in charge. Once inside we also meet Tim Roth (sporting a deliberately over the job English gentleman’s accent), Michael Madsen and Bruce Dern who are all similarly bedding in until the storm passes. 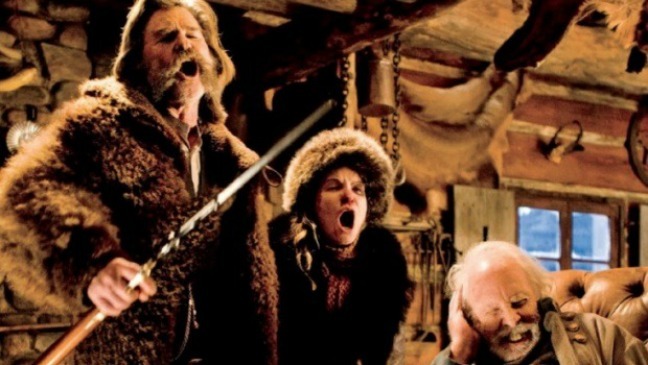 With eight potential lead characters on display much of the humour in based upon repetition and in simple sequences like the securing of a broken door Tarantino’s gift for comedy comes to the fore, making the scenes funnier than they have a right to be. With so many characters thrown together in a time not long after the civil war, it is no surprise that tensions mount (particularly with the presence of a black man) and the lodge is divided in two halves; the bar area representing the decadent North and the fireplace representing the warmth of the South and from here the relationships start to turn and the nine (8 travellers plus the coachman) become eight. Out of the blue Chapter 4 starts with a voiceover from Tarantino himself, recapping what has happened and pointing out some important plot points. But whilst this summary suits the style of movie and it is delivered well, it just feels out of place and I can only assume that this is where the interval would have been on the limited 70mm roadshow of the film in specially retro-fitted cinemas. As the chapter continues, the visitor numbers continue to fall as poisoned coffee kills off a few more and the already fragile trust to be eroded and suspicions to grow. As with many of his films, Tarantino makes healthy use of flashbacks to clear up the mystery of Minnie (the lodge owner) and the true identities behind some of the characters are revealed. In truth there aren’t really any great surprises until the introduction Channing Tatum, where the gore levels increase and the intelligence of the plot unfortunately begins to falter. As we move into the final chapter only 3 of our 10 main characters remain as the tale comes to its all too predictable but endearing close, leaving the viewer to decide which of the nine main characters (the eight plus Tatum) are the hatefuls and who is spared that ignominious title. With such a great ensemble cast there should be something in the film for everyone, but whether there is enough will be a matter of taste. Jackson, Russell, Goggins and in particular the brilliant Jenifer Jason Leigh give stand out performances, but Madsen (looking very odd with new romantic hair), Bichir and Tatum (from whom I have never seen an ounce of acting ability) less so. More disappointing though is the under use of a fine actor like Bruce Dern. I was also disappointed with the score. Not that I dislike Morricone’s work for the film, I love his main theme and the rest of his pieces are just fine, but it appears that the claim of his first Western score for over 30 years was all hyperbole as Morricone provided just 50 minutes of original work for a film just shy of 3 hours, with the rest of the score made up of three unused tracks from The Thing, a theme from Exorcist II: The Heretic and songs from other performers. It was recently commented by one of the MovieMuse team that of late Quentin Tarantino’s career has gone the same way as George Lucas’ latter Star Wars years. By surrounding himself with sycophants and yes men he doesn’t have a strong voice reigning him in when he takes things too far, tinkers too much or tries to be too clever and after watching both of his epic Westerns I tend to agree. Whilst there are wonderful performances and some very good scenes, the bloated middle section and predictable script drag the film down, as does some of the more unnecessary violence (such as an exploding head!). Choosing to film in 70mm was a great marketing move and helps to build the lore of Tarantino as the world’s most famous movie historian and defender of the art, but maybe that distracted him from creating a truly great script to go with his grand idea. Or maybe that was down to the multiple rewrites that were necessary after the original script was leaked online. 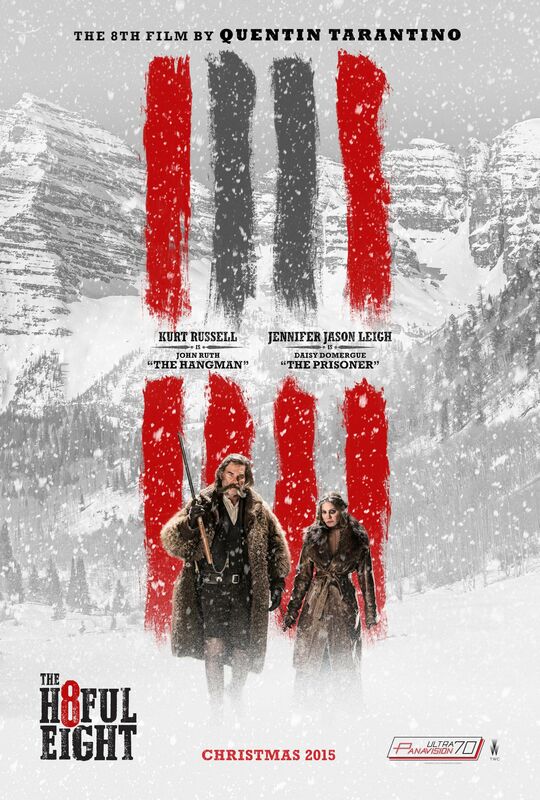 The Hateful Eight comes out of this as a good film and one I would rate higher than his well-received Django Unchained, but it is a missed opportunity due to a fairly ordinary script that fails under the weight of its cast, history and hype. With such a great ensemble cast there should be something in the film for everyone, but whether there is enough will be a matter of taste. Jackson, Russell, Goggins and in particular the brilliant Jennifer Jason Leigh give stand out performances and she at least should be in demand during awards season.